Must present printed voucher. Valid at Carolina Beach Road location only. No cash back for unused portion. 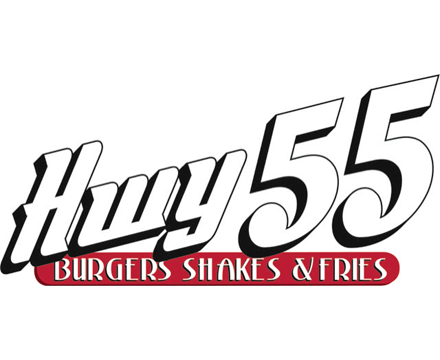 Kenney Moore opened the very first Hwy 55 in a mall in small-town North Carolina in 1991. It was called Andy’s Cheesesteaks & Cheeseburgers at the time, and its beginnings were humble: Kenney cooked every burger by himself from morning ‘til night. And this was in full view of his customers. He couldn’t afford a traditional restaurant kitchen. But Kenney soon realized something. When you’re manning an open grill, you can greet everyone who walks in. You can chat with guests sitting at the counter. You can cook a family their meals fresh right in front of them, and they can watch the care you put into doing so. And isn’t that what restaurants are supposed to be like? Neighbors bonding together over great service and tasty food? Today, we have over 130 of those open-grill diners across eight states and two countries, but their missions are the same as Kenney’s when he first opened the doors in 1991: to deliver authentic hospitality and fresh food to anyone who wants a little something more out of their dining experience.